Nowadays drone is popular as a a unmanned aircraft which offers the joy of flying with many features. People buy drone and want to try the best drone in the market, but they don’t know what is the best one to choose. Many drone companies release better version every time and people want to know the details about the products before they choose to buy it. The brands which popular in the maket are DJI, Yuneec, Syma, Hubsan, etc. Today this article will discuss about Hubsan X4 and Nano QX. Blade Nano QX is the smallest drone or quadcopter in the market. This drone is flexible enough to be flown. The size makes it easy to fly and this drone also cheap so this is the right choice for a beginner pilot who wants to try flying drone for the first time before buy the professional drone. This drone is equipped by safe technology makes it fly stable and its agility will makes you feel like a real pilot. This drone is very light you will love the great design and the performance of this drone. The battery is 150 mAh with 8 minutes flight time claimed by the company. From this article, the conclusion is both Hubsan X4 and Nano QX are a basic and small sized drone which having affordable price and well known as popular products especially for beginners. These drones easy to fly indoor or outdoor and without camera attached on them so that these drones exclusively made for they who wants flying drone without camera feature or looking for cheap drone with mini size for learning or playing with it. 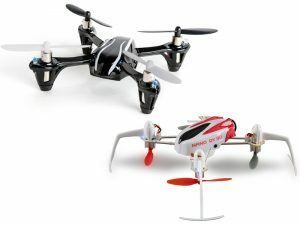 Both of products are also come with slight battery capacity so that they are not able to be flown for a long time.